Many of us keep a bottle of hydrogen peroxide in the household remedy kit. Hydrogen peroxide (H2O2) is a clear, colorless, odorless liquid, and its combination with oxygen is available in many strengths. One dilution of hydrogen peroxide is 35 percent H2O2 and 65 percent water, and food producers use various purposes, including processing cheese, bleaching wheat flour, and destroying microorganisms in food packaging materials. This 35 percent dilution is called “food grade” since it doesn’t contain certain stabilizers, phenol, acetanilide, sodium stannate, and tetrasodium pyrophosphate, which are found in most other commercially available hydrogen peroxide and should not be ingested. It is actually a potent antimicrobial agent which can be used in many different ways in the household. Yet, it is especially effective in the removal of excess earwax and the prevention of ear infections. Earwax, or cerumen, is the natural substance secreted by our body to keep the ears moist, free of bacteria, and lubricated. The ear naturally removes the excess of it, but if it starts to accumulate, hydrogen peroxide is the best way to soften it and unblock the ears. All you have to do is to add 1-3 ml of a 3% food-grade hydrogen peroxide in a syringe or dropper, tilt the head to the side, and apply a few drops in the ear canal. Press on the tragus slowly in order to pump in the hydrogen peroxide, and you will hear a bubbling noise. Then, tilt the head to the opposite side to drain the hydrogen peroxide from the ear, and remove the earwax from the outer ear using a cotton swab. Then, repeat the same with the other ear. 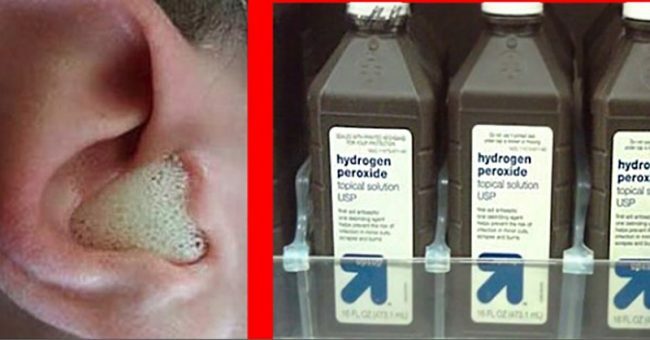 Moreover, 3% hydrogen peroxide is an excellent remedy for external ear infections (otitis externa), also known as swimmer’s ear, which result from an inflammation of the outer ear, that leads to pain, redness, itching, and discharge of clear fluid. Just pour a few drops in the affected ear, tilt the head to one side, leave it for 15 seconds, and then drain it out from the ear. Remove the excess earwax using a cotton swab, and repeat this three times daily. Always use a “food-grade” hydrogen peroxide, which has been manufactured and tested as safe to use. Also, remember that you should never take hydrogen peroxide internally since it can cause irritations, vomiting, burning, and abdominal pain. Also, avoid its use in the case of an inner ear infection, perforated or punctured eardrums.